(The AAoW files are in c:aaow, and I created a subdirectory c:aaowa to be the virtual floppy). Posted on February 9, 2006 by Scott Forrest and filed under Games, Software. I bought a beautiful set of chessmen a few years ago in Stornoway, Scotland that were modelled after the 'Lewis Chessmen.' These were a partial set of Viking chess pieces that were found on beach nearby to Stornaway, on the Isle of Lewis. Pretty cool looking, if I do say. The only problem (other than being a crap chess player) was that I didn't have a board. I wanted something suitably vintage to go with the medieval look of the pieces. Just by chance I was checking out an online auction site the other day and found a nice looking old board. As it happens, my â‚¬12 bid won an hour after I bid on it. It hasn't arrived yet, but I'm hoping it'll live up to my expectations, and I can begin learning chess all over again. Posted on August 10, 2005 by Scott Forrest and filed under Games, General. Who needs fully immersive 3D shaders and lighting effects, next generation AI, and real-world physics engines? I've gotten a bit hooked on a deceptively simple shareware 2D shooter called Soldat. 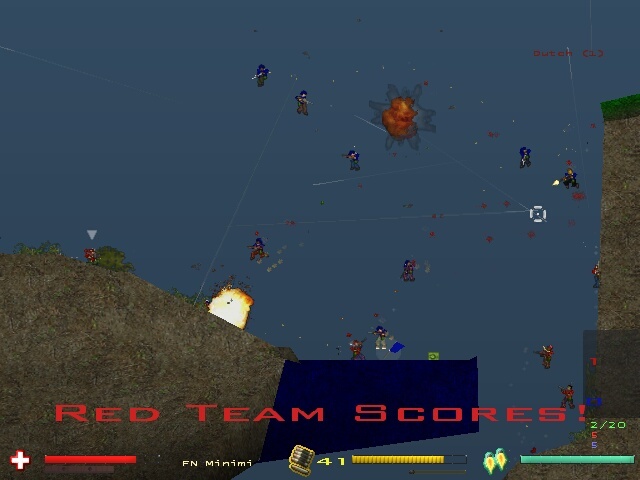 The action is frenetically fast pace, with bullets and body parts flying across the screen, and the little toy soldiers respawning in a constant stream of mass destruction. There's a wide array of weapons available, everything from pistols to a Minigun, with secondary weapons like knives, and my personal favourite: the chainsaw (perfect for slicing through a pack of enemies). The maps remind me of a pen-and-paper game my cousin Todd and I used to play, with movement and shots determined by skipping a pencil mark across the paper with one finger. How far we've come (not far, apparently). Posted on July 6, 2003 by Scott Forrest and filed under Games.